A fake website has been set up to mimic the H.S.E website that provides information for people seeking abortion services. Repeal campaigner Tanya Cody called the helpline number on the fake website to find out what information was being given to callers. The man she spoke to repeatedly asked her for her name and queried how far along her pregnancy was. On the third day of limited abortion services being available, anti-choice campaigners stood outside a health clinic in Galway protesting abortion services. The same thing happened in Louth a few days later. Senior Law Lecturer at the University of Birmingham, Máiréad Enright, said that these efforts to hinder abortion access could have been avoided. 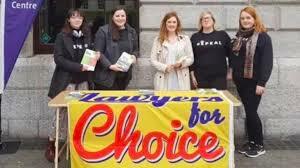 Máiréad and her colleagues at Lawyers For Choice published a position paper in July 2018 noting the key flaws in the draft legislation that Minister Simon Harris put forward. Day 3, January 2019 and the #loveboth ‘pro-life’ groups are already outside clinics intimidating & harassing women. “We assumed that it was draft legislation only, and the Minister would be open to changes once the legislation was actually debated in the Oireachtas. Their proposed legislation also included 100-metre safe zones, with fines or imprisonment for anyone engaging in intimidation, threatening or recording of people attempting to access premises where abortions are provided. Máiréad says that this “chilling effect” is already inhibiting access to abortion, with the Rotunda recently announcing that they will only provide abortions between nine and eleven weeks, rather than between nine and twelve weeks as permitted by law. During the campaign to repeal the 8th amendment women with wanted pregnancies spoke to the media about how the 8th impacted on their capacity to refuse consent while pregnant. Now that the 8th has been removed, Máiréad says attention needs to be paid to the wider impact of removing the 8th Amendment from the Constitution. According to Máiréad, the current law leaves too many people behind. But she’s a woman! What does she know about caring about human life? She should leave this to men to deal with…. Each woman should be given a chance to take control of her life. Every woman knows what is right or wrong for her. No amount of laws and pressure will change anything, Let each woman choose. But Musa, what if your daughter chooses to kill you?